The ever-morphing KC are currently enjoying a purple patch as a “double quartet”. With their huge, defiantly awkward music there’s plenty to keep all eight virtuosi busy. Three drummers – that’s more than The Glitter Band! – switch between industrious and intricate as ringmaster Fripp, Levin, Collins, Jakszyk and Rieflin aren’t given the slightest chance to think about ordering a curry. 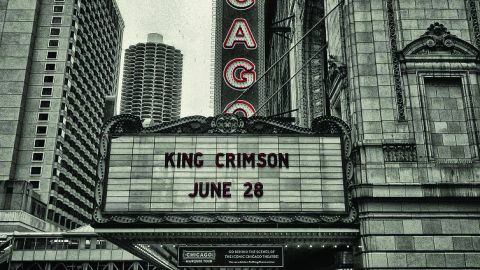 This is relentlessly progressive stuff, two lengthy discs covering tricky material from showpieces like Starless and 21st Century Schizoid Man to most of the Lizard album (played live for the first time). There are stabs from their more jagged 80s work plus a new song, The Errors, which is appropriately bombastic. Milestones amid the experimentation, those trademark doomy, almost metal riffs lock in. As the ensemble have themselves declared, this was a gig where everything sparked: Chicago fire. The encore of Heroes is earned.